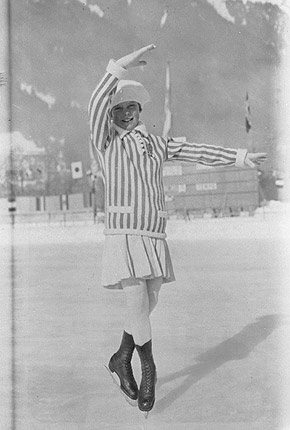 Sonja Henie won the first of ten consecutive world championships in figure skating in 1927 at the age of fourteen. She also earned Olympic gold medals in 1928, 1932, and 1936 before becoming a professional skater in 1936. She is credited with revolutionizing figure skating through the incorporation of ballet movement and music as well as daring spins and jumps. Henie’s earnings as a professional female athlete were unprecedented and she also profited from a successful film career in Hollywood that showcased her talents as a skater.